The MOTO W233 Renew looks like a green and black candy bar. The phone is four and a half inches by two inches, just over a half inch thick, and is pea green with black and silver portions. 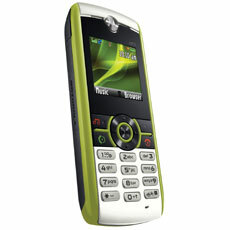 (It only comes in this ugly green color, and Motorola could definitely be accused of taking its eco message too literally.) The handset weighs a light three ounces though, which makes it feel like it can be recycled easily. The MOTO W233 Renew is a dual-band GSM phone, 850 and 1900 MHz.